Both Democrats and Republicans have blasted corporate buybacks. But political pressure hasn’t deterred America’s publicly traded companies, mostly in the tech sector, from buying back their own stock. S&P 500 companies bought back a record $223 billion of stock in the fourth-quarter, according to a new S&P Dow Jones Indices report, bringing last year’s total to an all-time high of $806.4 billion. The end-of-year buying marked the fourth consecutive quarterly record for buybacks, the longest such streak since S&P Dow Jones Indices began tracking the activity. If Sens. Bernie Sanders and Marco Rubio agree on one thing, it’s that billions of dollars of corporate stock buybacks need to be reined in. 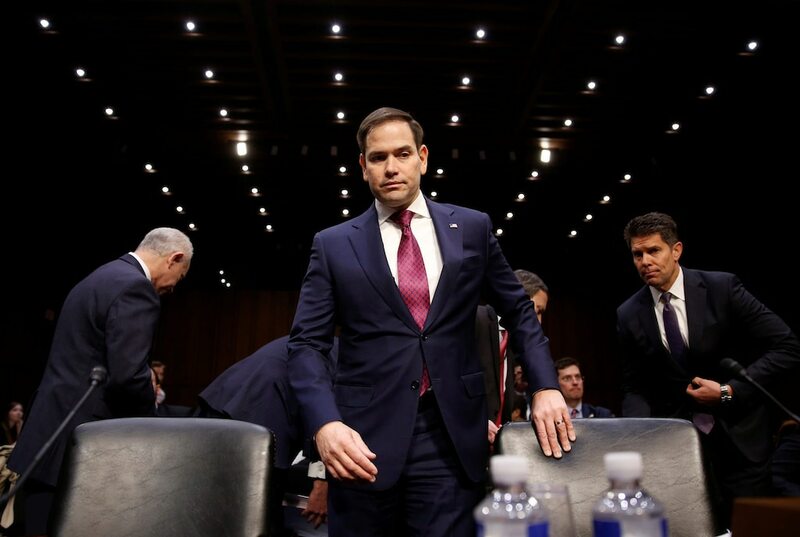 Sanders, a 2020 Democratic presidential contender, and Rubio, a former Republican presidential candidate, have both recently urged Congress to restrict companies’ share repurchases. And they’re not alone. A segment of politicians argue that soaring corporate buybacks exacerbate income inequality as cash is returned to shareholders at the expense raising workers’ wages and investing in longer-term development. That’s been fueled in part by cash they received after the Trump administration’s sweeping tax reform. “It’s clear that the SEC must review its current buyback rules to do more to protect investors,” wrote Senator Chris Van Hollen, a Maryland Democrat, in a release earlier this month. That very sentiment is challenged just as fiercely by business leaders and Wall Street strategists who believe tougher regulations on buybacks make companies’ less attractive to investors, in turn hurting businesses’ long-term expansion. But the political debate hasn’t discouraged public companies from repurchasing their stock — and lots of it. Companies in the S&P 500 executed a record $223 billion of share buybacks in the fourth-quarter, bringing the 2018 total to an all-time high $806.4 billion, according to a new report from S&P Dow Jones Indices. That was the fourth consecutive quarter of record S&P 500 company buybacks, the longest such streak in the two decades the firm has tracked the activity. “Shareholder returns continue to set records, but watching the buyback rate could give you a stiff neck,” said Howard Silverblatt, the senior index analyst at S&P Dow Jones Indices. 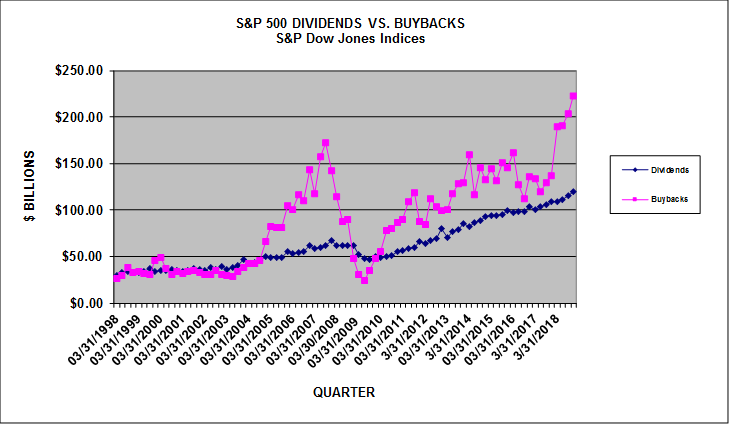 Which corporations are actually executing the buybacks? Most of them. Last year, 444 companies in the S&P 500 repurchased shares, up from 424 in 2017. Digging deeper, technology companies have dominated the buyback landscape, accounting for 34.5% of the total among S&P 500 companies in 2018. That was up from 22.9% the prior year. On the company level, investors can’t discuss buybacks without mentioning one of the practice’s biggest fans in recent years: Apple. The iPhone giant spent $74.2 billion on buybacks in 2018, the most of any S&P 500 company. Apple has also executed 12 of the 20 largest quarterly buybacks of all time, according to Silverblatt’s report. That may come as no surprise to those who know just how much cash Apple has on hand — the company said in its last quarterly earnings report that its net cash balance was $130 billion, and reiterated its plan for a net cash neutral position over time.